If you like to know how things work, you're a boat-lover, or have small children to entertain, you'll be interested in the different types of boat which plough through the waters and canals of Venice and its lagoon. 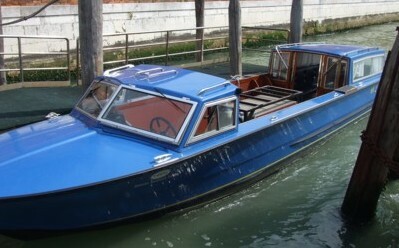 Apart from the car parks by the mainland bridge, and a private port area, all transport in Venice is by boat. And the more you think about it, the more difficulties that represents. Deliveries, emergency services, taxis - everything that is done on wheels in other cities must here be done by boat. So boats are a major part of everyday life, not just for passenger transport but for pretty much everything else too. This is very helpful for parents with children - architecture and churches might get boring, but who can get bored of boat-spotting? You could try setting your children challenges to spot as many of the following types of boat as possible. Delivery barges are the most common kind of utility vehicle you'll see. Big delivery firms like DHL and UPS have their own liveried boats. Other barges will pass by stacked with anything from casks of wine to shoeboxes. Some have freezers to transport cold food and drink. Once goods get as near to their destination as the canals permit, they are unloaded and wheeled on handcarts through the lanes to their destination. 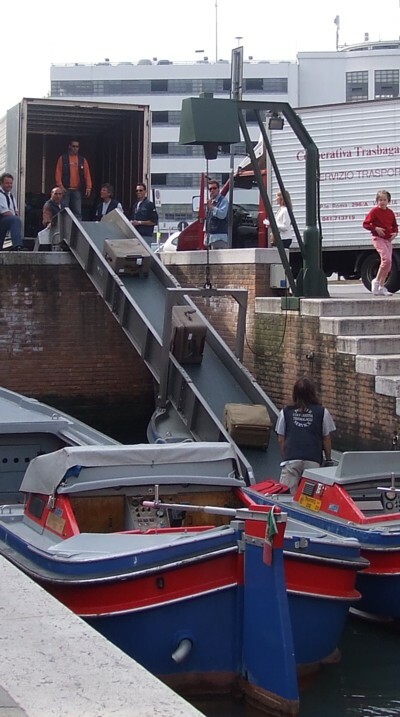 You can often watch shop merchandise being unloaded right alongside the Rialto Bridge. Barges are used for everything - we've seen trees and shrubs being delivered, a grand piano being unloaded outside a Grand Canal palazzo, domestic furniture, boxes of computers and much more. 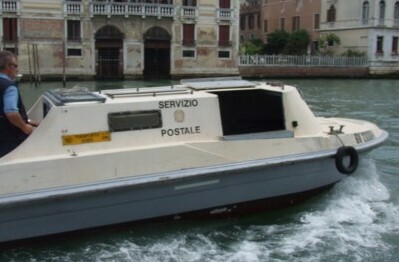 The Italian postal service have their own delivery boats. Some tour groups and guests arrange to have their luggage delivered directly to their hotel. 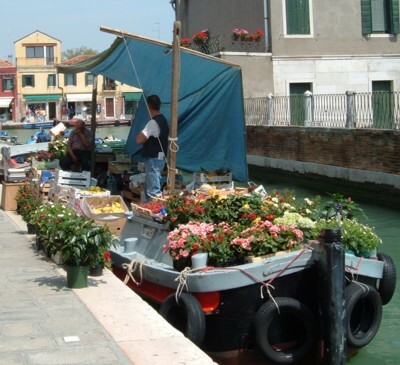 For us, one of the most fascinating spots in Venice is a little canal alongside the bus terminal in Piazzale Roma. Here vans arrive loaded with suitcases. An automated conveyor belt extends downward onto a moored barge and the suitcases all head down it to complete their journey by canal. The emergency services all operate by boat, of course. The fire brigade (Vigili del Fuoco), police and ambulances all have sirens, just like emergency vehicles on land, and woe betide any small boats that get in their way as they race down the Grand Canal, leaving a massive wake behind them. When the opera house La Fenice burned down, one of the many damaging factors was that the nearest canal was being drained, and the fire brigade boats could not get close enough (nor find enough water, nor was their equipment adequate, but that's a long story). 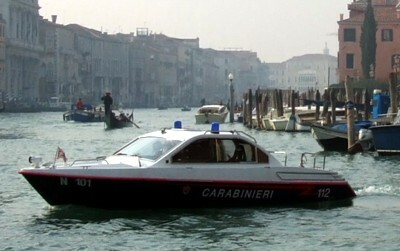 The fire station is located on the Rio di Ca' Foscari, where the fire engine boats are moored under shallow arches. You can often see them chugging peacably around the city's canals. The city hospital is on the northern shore, and ambulances are moored alongside. Police boats buzz all over the place. Italy has countless types of police force (military police, urban police, local police, prison police, finance police etc.) 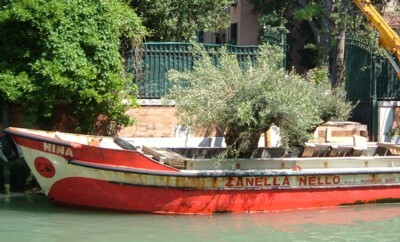 and during a busy event in Venice you may manage to spot boats belonging to all the different organisations. 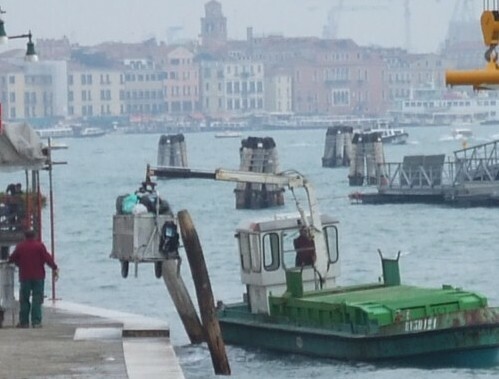 Since Venice's cemetery is on an island (the Island of San Michele), hearses have to be waterborne. Sometimes you'll see them heading through the canals towards San Michele, flowers piled on top of a coffin, and mourners curtained into the cabin at the rear. Rubbish collection is carried out by boat, too. Early in the morning the refuse barges chug along canals, meeting up with dustmen who've cleared every lane on foot, using handcarts. In places like the Zattere and Giudecca, where there is space for big communal rubbish bins alongside the canal, the boats arrive armed with little cranes, and tip the refuse from the bins into their boat's hold. When a specially adapted boat isn't available or appropriate, vehicles or machinery are brought on boats. 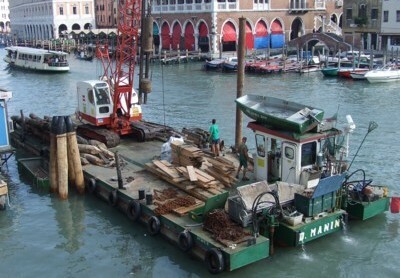 For construction work, cranes and heavy equipment are brought by water, on wide flat boats or pontoons. Often these will moor alongside the site, and the cranes operate from their floating base. When big events around St. Mark's are filmed, television lorries arrive by boat and drive onto the Piazzetta. 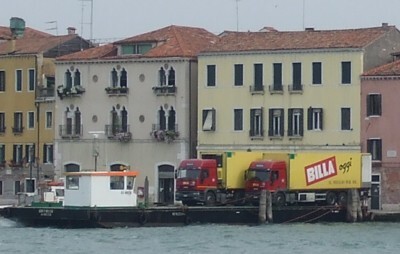 We've seen deliveries to the Billa supermarket on the Zattere (see photo) actually being carried out from a lorry, just like at home - except this lorry was parked on a boat moored outside the supermarket. Fruit and veg. boats aren't so common nowadays - mostly produce is just transported to shops and stalls - but there are still a few places where you can buy an apple from a greengrocer on a boat: one is moored at the end of Via Garibaldi in Castello, another very photogenic barge can be found near Campo San Barnaba in Dorsoduro, and a third on Murano. Here we've only dealt with utility and emergency vessels. There are also many different kinds of public passenger ferry running on the routes around Venice and the islands as well as a host of smaller private craft. It's common to see rowing crews training, including those practising traditional Venetian rowing (voga alla veneta), standing up and facing forwards. Gondolas are plentiful, and you can take a cheap ride in a traghetto across the Grand Canal to experience a gondola on a budget. There are also massive boats to spot - the cruise liners and Greek ferries which sail along the Giudecca and out to sea through the lagoon entrance by the Lido. A timetable for arrivals and departures is available online - see our links panel on the right. There are lots of rowing races in the lagoon, as well as traditional events like the historical regatta in the autumn. In early summer the Vogalonga is a colourful event with over a thousand rowing boats taking part.